Nikon, I hate to be so blunt, but you are fat. And no, it’s not just your lens, it’s your body too. The two biggest players in the Digital SLR market are Canon and Nikon. These two giants offer similar equipment ranges. But how do they weigh up against each other… literally? I’ve handled them, and I’ve looked at the numbers. 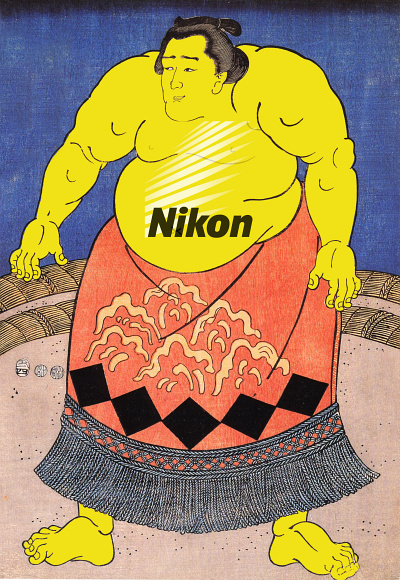 Nikon, you’ve got a weight problem. Shame on you. Before you decry me as a zealous Canon fanboy, I’ll just set the record straight: I own a Nikon D80, five matching lenses, and a SB-600 flashgun. I love their ergonomics, and I’ve taken them all over the world. They’re still give me great service. And I’ll probably upgrade to the yet-to-be-announced D90’s successor. But I do have an issue with weight – bigger does not always equal better. I realise that top quality photographic gear come with a weight penalty. Large image sensors and fast processors use more electricity and therefore need larger batteries, and large aperture lenses and bright viewfinders require larger chunks of glass. Solid construction and weatherproofing add still more weight. Let’s for the moment forget the promise of mirrorless large sensor cameras, and accept that a choice has to be made between compactness and performance. For me, performance is very important, and hence when I get serious, I leave my nimble Panasonic LX3 at home and instead take off with my DSLR battleship. I even climbed Kilimanjaro with my D80, wheezing through the thin air with it’s 1.3 kg (lens included) bulk anchoring me down. My problem is that, when you compare it to its largest rival Canon, the Nikon almost invariably weighs in heavier. And it’s not clear what you’re getting in exchange for the extra bulk, or why it’s necessary. Generally I find Nikon’s cameras more ergonomic than the competition, but do you need hundreds of grams to sculpt a more comfortable hand grip? I think not. The oddball is the Nikon D90, which offers most of the features of the 50D, but without its fast shutter, continuous shooting and magnesium alloy body. In price too, the D90 is a closer match for the 550D, but offers a dual control dials, a top LCD and pentaprism viewfinder. Some ambiguity also exists in whether the Nikon D300s is best matched to the Canon 50D or 7D. Despite the difficulty in perfectly aligning Canon and Nikon’s ranges, the same trend always emerges: Nikon’s DSLRs are generally heavier than their feature-matched Canon partners. *Nikon’s lenses carry the “Nikkor” name. †The Nikkor zooms to 24mm, compared to Canon’s 22. ‡The Nikkor’s max aperture at 70mm is 4.5, compared to Canon’s 4.0. On average, this selection of Nikkor lenses are 14.5 % heavier than their Canon counterparts. If you put them all in a bag (as many enthusiasts do) you’ll be carrying an extra 300g if you choose Nikon. And that’s before taking the extra weight of the body into account. In comparison, the Canon guy can easily carry an extra lens with no total weight penalty. I don’t think this extra weight is due to maliciousness on Nikon’s part. Maybe it’s a legacy of their venerable F-mount, which has one of the longest flange back distances in its class, and also requires a body-mounted autofocus motor for many of its older lenses. Canon decided to take a technological leap in 1987 by completely redesigning their lens mount. Nikon instead chose for backward compatibility, and now they have to deal with its disadvantages. The antiquity of the F-mount is put into even starker contrast by the latest Sony NEX mount, which dramatically reduces bulk without reducing the sensor size. Nikon gradually phases in new technology such as lens-integrated focus motors, but the slow transition forces them to build a lot of (heavy) redundancy into their cameras. Maybe it’s time for a radical redesign? In my post on the dangers of having a big camera, I stressed how important the bulk-and-weight issue can be. You make wonderful cameras, Nikon. Sometimes, I can forgive you for breaking the bank. But please, don’t break my back also! how do you like the 18-200mm? Hi Ari – the 18-200 is good for what it is, and the most useful lens for travel. But it’s a compromise. I get more beautiful effects with my dedicated special-purpose lenses. I don’t see the problem to be honest. OK, in extreme cases such as a serious mountain expedition it might be an issue. But, if you can afford that why not throw in a m4/3 cam with pancake lens? * I’m convinced that DSLR manufacturers design for light weight. Why else use expensive magnesium alloys instead of stainless steel? Extra weight is a sign of failing in that design objective. * An overly light body is less stable, but once you pass 500g or so it’s not much of an issue any more. Adding more weight adds little further stability in normal use cases. * Most of the photographers I know see their DSLR’s weight as a big disadvantage. It’s something they’re willing to live with, but not something they prefer. Not while shooting per se, but you also need to carry your gear to and from location. * Most DSLR users actually do carry around their gear. Vacation, etc. While 1kg might not be critical for you, it might be for some. Think about airport hand luggage limitations. And I’d rather carry a bottle of wine along on a hike than an extra kilo of dead metal weight. If I am considering to buy the only Canon DSLR that loses w.r.t. weight from the corresponding Nikon, am I doing something wrong? I also think the 50D is more comfortable to hold than my current 1000D (or the 550D that you listed). I can put all my fingers around the grip, while on the 1000D my little finger has to find a resistance by pushing up against the bottom of the camera. Tim: no you’re not “doing something wrong” – there are of course more factors which are important than just weight. I actually wanted to blog about it, but didn’t get round to doing it yet. Having said that, I’m not such a big fan of the 50D. I’d even (maybe) consider a 40D before the 50D… Main reason being the 50D’s comparitively poor noise performance. Either the 550D or 7D outperform the 50D in this respect. But, yes, ergonomically the larger DSLRs outperform the “Digital Rebels”. That was one of my two main reasons for getting the Nikon D80 instead of the Canon 350D back in the day. In use they’re better. But in the bag they’re bricks of lead. Still, I have to see if the upgrade is worth the money for the amount (and quality) of photos that I make. What was your other reason for getting the Nikon instead of Canon 350D? My other reason was the 18-200mm stabilised lens, which is a great jack of all trades. At that time the closest thing Canon had was the (optically worse) 17-85mm. In terms of “system” the Nikon made a lot more sense. Things have changed since then – Canon improved their viewfinders and lens line-up, and Nikon improved their sensor performance, so it’s a different playing field. If I had to start from scratch today I’d probably buy a Canon DSLR, or venture into a mirrorless system. Too bad MILCs are not mature yet… I think the big boys (after Panasonic/Olympus and Sony) are also going to enter the MILC market soon. There is one thing you’re totally missing here: Pentax. They make high-quality bodies which are very small and light for their class. Just compare their K5 with a Canon 7D for example. One of my reason for choosing the K5 together with a set of limited primes is their very small size and weight. Making them ideal for travel. They really aren’t that much bigger then say a panasonic 4/3 GH-something.